Vacation time! So exciting, so relaxing, so short. What if you could get that vacation feeling just outside your back door, in your own yard? Take a look and turn your next vacation into a multi-season staycation. Think outside of the box. Today’s decks are no longer just rectangles attached to your back door. New configurations and shapes, incorporated seating and multi-use areas are now standard fare. A new deck extends your living space by creating a new outdoor room, complete with all the extras that make outside time all the time. In the past, summer kitchens were commonplace. Folks did their best to keep the house cooler by preparing meals in an outdoor kitchen. Today, although most of us have climate control, the idea of grilling dinner outside with drinks on the patio, seems far more appealing than staying inside when the outdoors beckon. 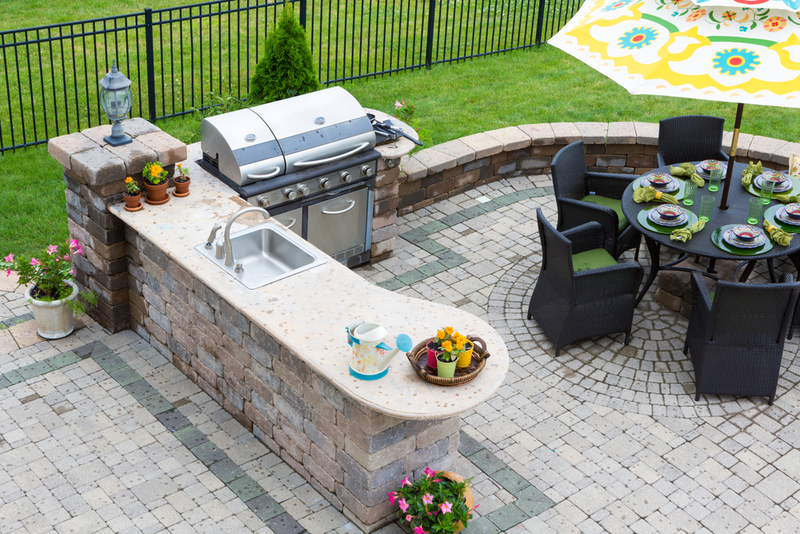 An outdoor kitchen can be as simple, or elaborate, as you’d like. In addition to cooking surfaces, spaces now offer wet sinks, electricity and refrigeration to keep all the preparation outside. Want to see your favorite program, and the starry night at the same time? No problem. Outdoor entertainment centers can incorporate both television and music to enhance your outdoor living. Working with a skilled professional, you can design an entertainment area suitable for soft jazz on a summer night, and football games come fall. We all love the idea of our favorite pizza, handcrafted and pulled fresh out of an old brick oven. The smell of baking bread and cheese. It can’t possibly get any better than that, right? Hold the phone. An outdoor pizza oven of your own brings all those magical scents and tastes to your backyard. Today, you can have a beautiful pizza oven incorporated into your outdoor plan, and pizza night can be any night. Now that you have some ideas, take a few moments and consider what appeals to you the most right now. That’s your starting point. Then get together with a professional that can help you design a plan for the long-term. Vacations are wonderful, but they are short-lived. Creating a space that can make your home an oasis and the setting for longer staycations is an investment in you, and your home. Win-win. Ready? Let’s get started.